WARBEAST presents an alternative system of play, more suitable for multi-player and beginners. Designed to be an easy and fast Family Game. WARBEAST includes an additional 10 races, each compatible with WARANGEL. It includes a rulebook split into 3 levels to allow children and beginners to easily approach this universe. In the box you have a complete game compatible with WARANGEL, which includes nine warrior races plus the Warbeasts, which are deadly creatures that you may fight or control. 90 compatible warriors races and two systems of play form the universe Warangel-Warbeast. Choose your race and the system you prefer and you'll experience fantastic matches with warriors and battlefields that are always changing. 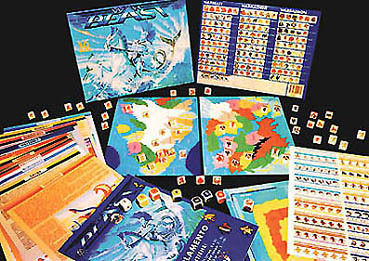 WARBEAST - 4th Generation: complete boxed game, including rulebook and reference sheets printed in english and in full color. WARBEAST is a system of game, linkable with Warangel, created to be a Family Game, for battles faster and easier, with many players. In the package you find nine warrior races plus the Warbeasts, deadly creatures that you may fight or control. The universe Warangel-Warbeast is formed by 100 compatible warriors races and two systems of play. Choose your race and the system you prefer, you'll have fantastic matches with warriors and battlefields always new! 1 RULEBOOK splitted on 3 levels to allows also children and beginners to easily approach this fantasy universe. 9 MAPS splitted in zones (WARBEAST's army does not have an own territory: these monsters invade territories of other 9 warrior races). 8 DICES to build up (you have the printed faces to paste on real dices). 10 COMPLETE ARMIES to cutoff. Counters in the box are to cut off, to be utilized as upsidedown â€œVâ€� standing counters or to be folded just to have the warrior picture on a face and the warriorâ€™s values on counterâ€™s back. A complete english translation of rulebook and reference sheetsis included.